Tableau 2019.1 brought some killer features to the table, and amongst these was a natural language capability called Ask Data. This blog will focus on the applications of the tool, and how it could change your business. 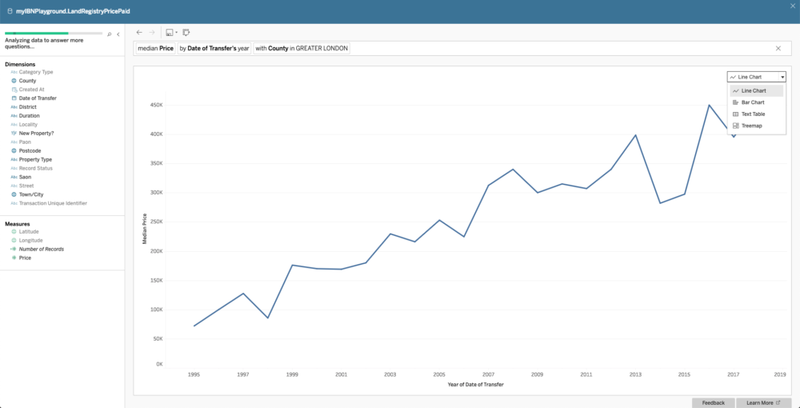 The area of natural language processing has grown over the past decade, and Tableau made their move by acquiring ClearGraph in 2017. The startup’s focus was to allow users the ability to analyse data using natural language. Tableau’s ethos has very much been on lowering the boundaries to allow people to “see and understand their data”, and Ask Data seems to lower that boundary further. Ask Data allows users to type in natural questions such as “How much did we sell last week?” or “Show me the median price of terraced-houses in Richmond”, and having Tableau understand the question, translate it into ‘Tableau speak’, run the query and then return the best visualisation for the job – all in one fell swoop. 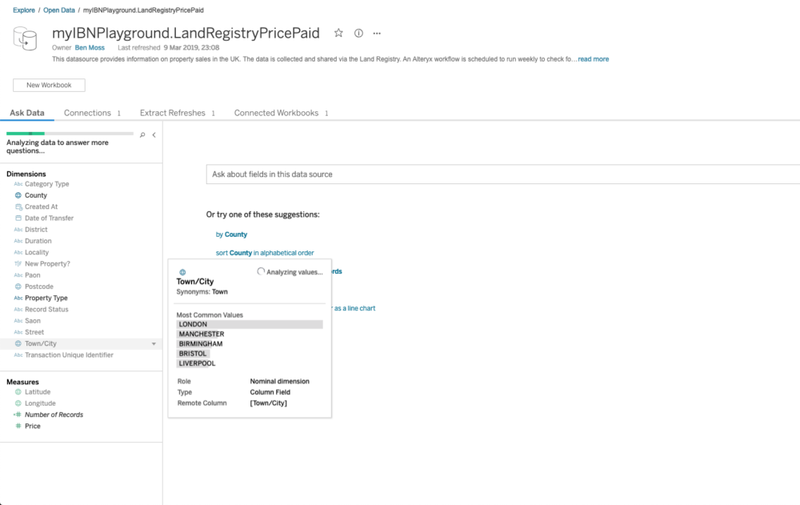 As shown above, one of the most beloved features of Ask Data amongst the Tableau Community has been the analysed metadata view – which allows the user to hover over dimensions and measures to get a flavour of the data. The HUGE thing, in my opinion, is the changes this will drive for governance en-masse. Folks will have to focus upon the curation, development, description and drive understanding and data literacy around these tools. What’s a pleasure is the fact that even after this process, you are able to change the chart type, among other things, on the fly. There are a lot of common questions that I have heard around Ask Data. For example, will I be able to be more conversational with Ask Data? This looks like it’s coming in 2019.2 and the improvements that this will bring. Another additional feature coming is the ability to create multiple tabs – Currently in Ask Data, you are only able to do one instance of analysis, than develop and get answers to questions on multiple tabs. 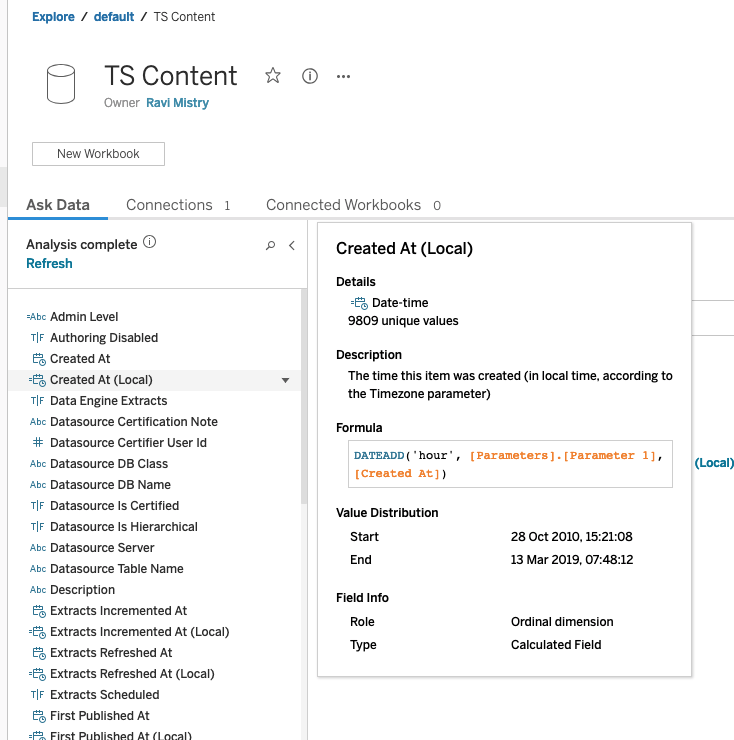 Ask Data is a feature which extends beyond what it is – the feature allows more people to get started with Tableau with a lower barrier to entry, and also ensures the focus on curation and governance of datasource is growing.